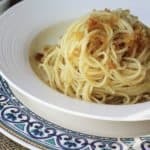 Pasta ca’ Muddica or Pasta with Breadcrumbs, another classic example of cucina povera, or making do with what you have. 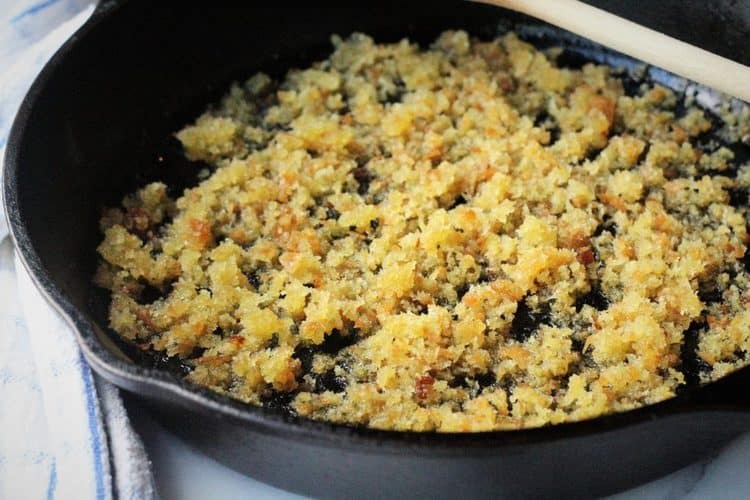 Some enjoy this dish with anchovies but I prefer plain breadcrumbs and, of course, extra cheese on top! Pasta with breadcrumbs or “pasta ca’ muddica” as we call it in Sicilian. This is peasant food at it’s best! 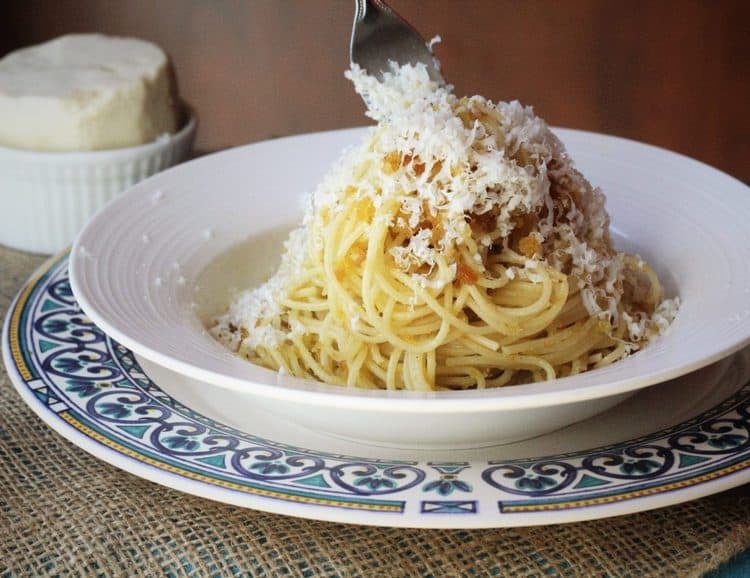 All you need is leftover bread, spaghetti, olive oil and grated cheese. Pasta ca’ muddica is what my mother made when we were little. These days whenever we visit she goes all out and prepares the Sunday sauce with the meatballs, sausage and the stewed meat. Otherwise she feels like she’s not feeding us anything worthwhile. But occasionally, I ask her to make the simple dishes that I enjoyed as a child for my children as well. I’d like for them to be exposed to these traditional meals. At first, my son did not take to this pasta while my daughter loved it. He never liked pasta that was crispy, especially those corners of lasagna that harden in the oven. And here was a pile of little crispy bits of breadcrumbs all over his spaghetti! He soon got past it and now will eat bowls full topped with hot peppers in oil. This is the perfect dish to make on those nights when you’re in a hurry, As long as you have some day old bread lying around, you’re all set to go! I have visions of my mother grating her bread by hand on your typical box grater. Especially on Sundays when she needed fresh breadcrumbs for her meatballs! To prepare my breadcrumbs, I take a piece of bread (crusts removed) and pulse it a few times in the food processor. You don’t want fine breadcrumbs but coarsely grated pieces that will brown and crisp up nicely in the olive oil. Dried breadcrumbs will not do here. I had some bread that was about to go stale the other day so I made a batch of these breadcrumbs. I kept them in the fridge for a few days until I was ready to make this pasta. Alternately, you can freeze your breadcrumbs. Several variations of this dish are possible. Some include anchovies (we never liked them! ), hot pepper flakes, garlic, pine nuts and even raisins. So you can definitely vary the recipe according to your taste. But in our house we stick to the traditional breadcrumbs and cheese. Many readers have told me that they serve this pasta on Christmas Eve or St-Joseph’s Day. At our house Pasta ca’ Muddica is not associated with a special holiday. We enjoy it as a quick and easy dish any time of year! Let me know how much you love your Pasta ca’ Muddica by sharing your photos with me with @mangiabedda or #mangiabedda on Facebook or Instagram. Don’t forget to Pin the recipe on Pinterest as well. Buon Appetito! 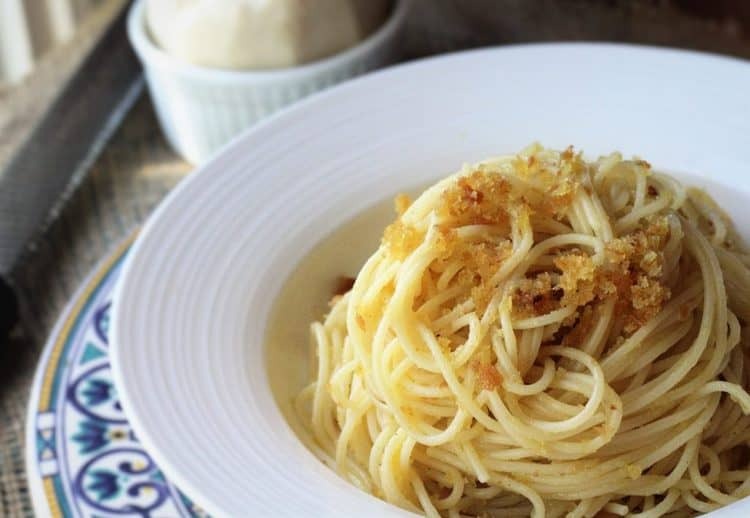 Pasta with Breadcrumbs or pasta ca' muddica as we say in Sicilian, is an easy last minute dinner idea and a perfect example of 'cucina povera'. Bring a large pot of water to a boil. Add salt and cook spaghettini until al dente. Meanwhile, heal oil in a large skillet on medium high heat. Add the breadcrumbs and fry, stirring often, until the crumbs are crisp and golden, about 5 minutes. Remove from heat. Add the breadcrumbs to the drained spaghettini and combine well. If the pasta is too dry stir in a little extra olive oil. Add freshly grated black pepper and serve with grated cheese. It truly is Marisa. These traditional recipes need to be preserved! It really is delicious! For the longest time, my mom didn't make it and I reminded her about it. My kids finally tried it and they love it so now it's on the menu on a regular basis. Thanks for stopping by my blog Philip! Hi Philip, my mom makes pasta with broccoli all the time but not with the other ingredients you mentioned. I would steam or boil the broccoli until tender. Then saute an onion and garlic, add the broccoli, raisins and pine nuts. I'm guessing the tomato sauce might be prepared separately and then added to the broccoli mixture. This is how I might go about it if I had to guess. Hope this helps!